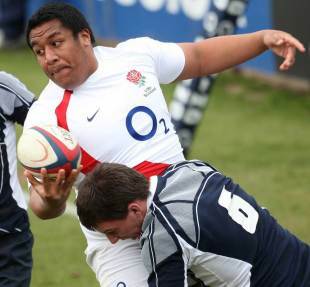 Fiji coach Inoke Male has lashed out at England labelling them "vultures" in the aftermath of New Zealand-born Mako Vunipola's call up to the national side. Vunipola, the son of Tongan international Fe'ao Vunipola, was called up by England on Thursday and he will join Manu Tuilagi in the squad whose elder brothers turned out for Samoa. Fiji come face-to-face with England on November 10 at Twickenham and Male has named a much-changed squad for their European tour. He has included 16 uncapped players in the party, alongside figures such as Leicester's Vereniki Goneva, and Male claims that certain players he wanted to include in the squad spurned his advances with a view to qualifying to play for England or France in the future. "There are several players not available to us for this tour because they want to play for other countries," Male told The Times. "Young players now want to pursue options for other countries rather than coming on tour which is not a good sign. "We have got a lot of problems caused by European countries, especially France and England, who have taken some of our players through their academies when they were young. England and France have got a lot of players to pick from already and, as a small country, for our players to be poached from us is not acceptable. "There is one very talented player we wanted to select who went to an English academy and he is now 16 years old and has opted to play for England. It is very obvious what is happening. If you go to the secondary school championships you will see scouts from Australia, New Zealand and England trying to find your players who want to go overseas. They are taking our young players like vultures." And Male wants the International Rugby Board to do more to prevent the well-trodden path of Pacific Islander-born players opting to play for European nations. "I will not tell you the specific players but I know of players who get invited to the UK when they are 14," Male said. "Now as 17-year-olds they are opting to play for England. That means everybody here who is young wants to play for England. "As a good player that's what they choose and we respect that but it is mainly because of the money. That's what happened when boys are given the option. We need the IRB to stop this rule or change it." The IRB responded saying: "The IRB is committed to supporting Pacific Island rugby. We invest over £4 million a year in competition structures, high performance and educational scholarships, development and union administration in order that these great rugby nations can continue to compete at the highest level."